(VEN) - The prime minster has approved Dong Nai Province’s revised industrial development plan. It focused on developing 36 industrial parks on a total area of about 12,058ha. Dong Nai is one of several localities that have attracted more than US$100 million investment projects including Formosa and Vedan (Chinese Taipei), Hualon (Malaysia and Chinese Taipei) and Fujitsu (Japan). In the 2011-2015 period, many foreign groups including CJ and Hyosung (the Republic of Korea), Amata (Thailand) and Forval (Japan) have focused investment on industrial parks in Dong Nai. 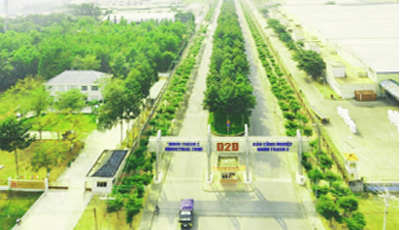 According to the Dong Nai Industrial Park Management Board, the province had granted investment licenses for 71 foreign direct investment (FDI) projects, with a total registered capital of US$1.34 billion in the first nine months of 2015. It also gave the go-ahead for 10 domestic invested projects with a total registered capital of nearly VND4.7 trillion, and adjusted more than 360 investment licenses in the same period. To date, the province has registered 1,396 projects by investors from 42 countries and territories underway in 32 provincial industrial parks, especially Nhon Trach V, Amata, An Phuoc, Loc An-Binh Son and Giau Day. Despite encountering difficulties during the 2011-2015 period due to the global economic crisis, Domestic investors have continued increasing investment in industrial sectors. So far, the province has registered 635 domestic projects worth nearly VND169 trillion. Currently, 602 of 635 projects are underway worth of more than VND141 trillion. Dong Nai has 27 industrial clusters occupying more than 1,500ha, including two basically completed in terms of infrastructure construction, one under construction, eight under investment and 16 looking for investors. In the 2011-2015 period, the Dong Nai Province People’s Committee issued Decision 2048 /QD-UBND on attracting investment in sustainable economic development, with a focus on green industrial production. Recognizing the importance of environmental protection, the province has encouraged investors to apply clean technologies, employ fewer workers and improve environmental protection efforts, while refusing to accept investors that still use out-dated technologies prone to polluting the environment. In an effort to facilitate investors in the province, Dong Nai has shortened the time limits for granting FDI investment license to 9-25 days instead of 14-32 days as before. Some FDI investment licenses were granted within seven days. About 90 percent of investment licenses have been granted as scheduled.